In our second blog in this series, we attempt to analyze the real size of recoverable Saudi reserves, as well as the reasons Saudi Aramco may have pulled their IPO, which would have been the largest stock flotation in history. Picking up where we left off in last week's blog, we strongly believe Saudi Aramco’s estimated reserves of roughly 260 billion barrels are being overstated. No one outside of the highest levels of Aramco has access to the necessary data to make an accurate assessment of Saudi’s reserves, so any attempt to estimate the size of these reserves must use some indirect method. 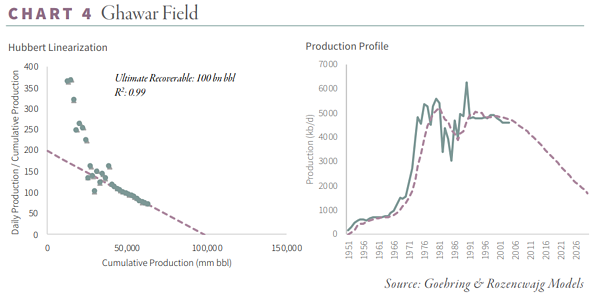 To estimate the true size of the Saudi reserves, we are going to present results from methods that have proved very useful in the past to accurately estimate ultimate recoverable reserves of certain fields or hydrocarbon producing regions, as well as predicting when a field or region’s production will peak. We use a simple mathematical technique called Hubbert Linearization. King Hubbert was a famous and extremely controversial geologist who worked for Shell Oil from the early 1940s all the way to the 1960s. Hubbert’s theories centered on the belief that the future production profile of a hydrocarbon basin could be fairly accurately predicted, given several assumptions. Hubbert believed that following the discovery of a new oil or gas field, its production would follow the shape of a bell curve. Hubbert Linearization often provides a good estimation of total recoverable reserves. Once half of the recoverable reserves were produced, Hubbert believed the field’s production would decline. Hubbert’s analysis gained a huge amount of prominence after he used it to predict that US oil production would peak in 1970 at 9.5 mm b/d and ultimately recover 200 billion barrels of oil. While Hubbert failed to predict the rise of shale production some 50 years later, if you look only at conventional oil production in the US, his prediction was amazingly accurate. Although controversial, (we admit that one of Hubbert’s biggest drawbacks is that it fails to capture ever-increasing field recovery assumptions), we decided to apply Hubbert Linearization to the largest of the Saudi oil fields, the Ghawar field, which at its peak represented over 50% of total Saudi production. Ghawar is by far the world largest oil field. Discovered in the late 1940s, the field formed the foundation of the Saudi oil industry for decades, and it has been a massive contributor to the growth in global oil production since the end of the World War II period. On the right, you see the production history of the field . We have good data going up to 2008, however after that point data becomes difficult to find. On the left is the Hubbert Linearization of Ghawar’s production history, a plot of cumulative production versus the ratio of current production to cumulative production. In a field where production grows at an exponential rate, plateaus, and then begins to decline, this logistic growth function will exhibit an initial “noisy” period before settling into a very predictable straight line that can then be extrapolated to estimate a field’s ultimate recoverable reserves. Out of the 100 billion barrels of recoverable reserves, we believe Ghawar has produced approximately 75-80 billion barrels to date, meaning that at most only 25 billion barrels remain. If our analysis is remotely accurate, two important conclusions can be drawn. First, although Ghawar’s remaining 25 billion barrels of proved reserves are among the world’s largest, our modelling tells us that Ghawar’s oil production is definitely in decline. Although we have no official data, we believe Ghawar’s production peaked out at 5.5 mm b/d and has been in decline for a decade. Second, it has always been believed that Ghawar represents over 50% of the Saudi total reserves. If Ghawar stands at just 25 billion barrels of remaining reserves, and no significant oil field discoveries have been made since the 14-billion-barrel Shaybah discovery all the way back in 1968, one must seriously question the Saudi’s claim that they still have 260 billion barrels of remaining reserves. Although there has been chatter on the internet claiming that the independent reserve engineers are “satisfied” that Aramco’s reserve statements are “realistic,” we believe the Saudi Aramco IPO was pulled because it would be extremely problematic for the Saudis to admit their reserve figures have been vastly overstated for years. It would also call into question whether Saudi Arabia really has the large volumes of “excess” pumping capability they have always claimed. This blog contains excerpts of our recent in-depth Q3 2018 commentary, INTO THE "RED ZONE" WE GO. If you are interested in this subject, we encourage you to download the full commentary here. Goehring & Rozencwajg Associates, LLC. The information provided on this website is intended to provide the investor with an introduction to Goehring & Rozencwajg Associates, LLC. Nothing on this website should be construed as a solicitation offer, or recommendation to buy or sell any security or as an offer to provide advisory services. Information on this website is intended only for United States citizens and residents. Nothing contained on this website constitutes investment, legal, tax, or other advice nor should be relied upon in making an investment or other decision. Investors should always obtain and read an up-to-date investment services description or prospectus before deciding whether to appoint an investment advisor or to invest in a fund.